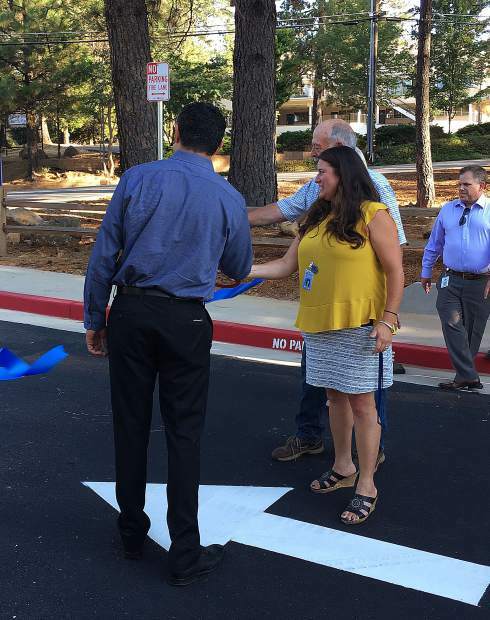 Nevada Joint Union High School District assistant superintendent Dan Frisella, left, joins principal Kelly Rhoden and board member Jim Drew in cutting the ceremonial ribbon on the high school's new parking lot Monday. After months of construction, Nevada Union High School unveiled its new student parking lot Monday morning. The project was made possible by $2.6 million in funds allocated through Proposition B, a school district bond measure passed by voters in 2016. The approval of the measure allowed Nevada Joint Union High School District $47 million in bonds to upgrade and improve local high schools. The project included extensive underground utility work, new sidewalks that are Americans with Disabilities Act compliant, new student drop-off areas, new lighting and a new school entry stairway and ramp. Nevada Union principal Kelly Rhoden thanked those involved with the project before cutting the ceremonial ribbon. Rhoden said the project moved along at a steady pace and she and her staff could see changes from day to day, an experience she described as reassuring. Local companies Siteline Architecture, Sierra Land Solutions, The Engineering Enterprise and Hansen Brothers Enterprises all contributed to the project. Weiss Brothers nursery was brought in for additional landscape work.